As the S&P 500 grapples around the 2,800 mark, it has achieved an impressive 12% year to date gain. A pause or a pull-back whilst macro events like Brexit and the US-China trade talks are resolved are a possibility given the near 17 forward PE. I thought it would be worthwhile looking at some of the high flyers in the market to search for value. I selected a group of 12 stocks that have increased by 25% on average since the beginning of the year. The list is dominated by business software firms that are squarely in the SaaS, cloud and AI hype. Firms like ServiceNow (NOW), Workday (WDAY), Tableau Software (DATA), Splunk (SPLK), Adobe (ADBE), Salesforce (CRM), Palo Alto Networks (PANW) and the smaller Altair Engineering (ALTR). Others included in my sample are Square (SQ), Paypal (PYPL), VMWare (VMW) and my old friend Nvidia (NVDA). 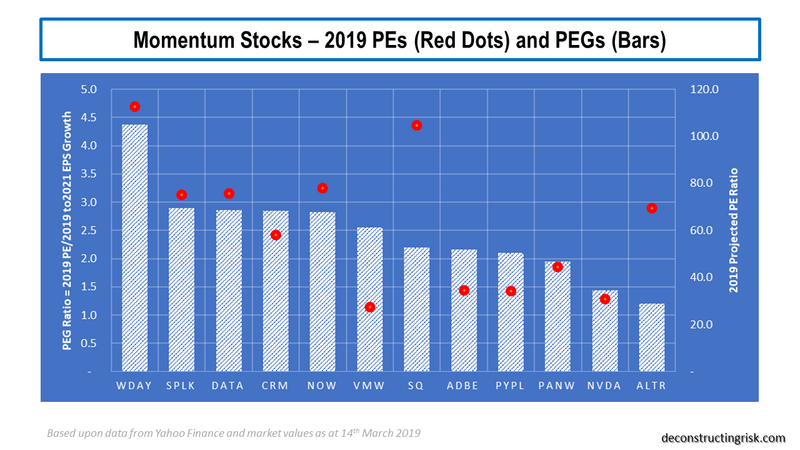 Using data from Yahoo Finance, I compared each of the firm’s valuation, based upon today’s close, using their 2019 projected PE against their PEGs, using projected EPS growth for the next 3 years. The results are below. These are not cheap stocks (a PEG at or below 1 is considered undervalued). As per this FT article, the CEO of ServiceNow John Donahoe summed up the market’s love of some of these stocks by saying “investors value, first and foremost, growth”. By any measure, “value” in that quote is an understatement. I have never been good at playing hyped stocks, I just can’t get my head around these valuations. I do think it indicates that the market has got ahead of itself in its love of growth. I am going to focus on the two most “reasonably” valued stocks on a PEG basis in the graph above – Nvidia and Altair – by running my own numbers (I always distrust consensus figures). I have posted on my journey with Nvidia previously, most recently here in November after their first revenue warning. Amazingly, even after a second big revenue warning in January from ongoing inventory and crypto-mining headwinds, the stock recovered from the 130’s into the 150’s before again trading into the 160’s in recent weeks following the Mellanox merger announcement. NVDA purchased Mellanox, an admired data centre equipment maker, at 25 times 2018 earnings (which seems reasonable given Mellanox is growing revenues at 25%). NVDA’s recent quarterly results were not only worrying for its near 50% sequential decline in gaming but also for the 14% sequential decline in its data centre business, its second largest segment which was growing strongly. Despite management’s assertion that the gaming segment’s quarterly run rate is $1.4 billion (Q4 was below $1 billion), I am struggling to match analyst revenue estimates for FY2020 and FY2021. The most optimistic figures that I can get to (pre-Mellanox), assuming the crypto-mining boom is removed from the trend, is $10.3 billion and $12.8 billion for FY2020 and FY2021, 8% and 4% less than the consensus (pre-Mellanox), as below. Based upon management’s guidance on expenses (it is impressive that nearly 9,500 of their 13,300 employees are engaged in R&D), on the Mellanox deal closing in calendar year Q3 2019, and on 15 million shares repurchased each year, my estimates for EPS for FY2020 and FY2021 are $5.00 and $7.77 respectively (this FY2020 EPS figure is below analyst estimates which exclude any Mellanox contribution). At today’s share price that’s a PE of 33 and 21 for their FY2020 and FY2021. That may look reasonable enough, given the valuations above, for a combined business that will likely grow at 20%+ in the years thereafter. However, NVDA is a firm that has just missed its quarterly numbers by over 30% and it should be treated with a degree of “show me the money”. 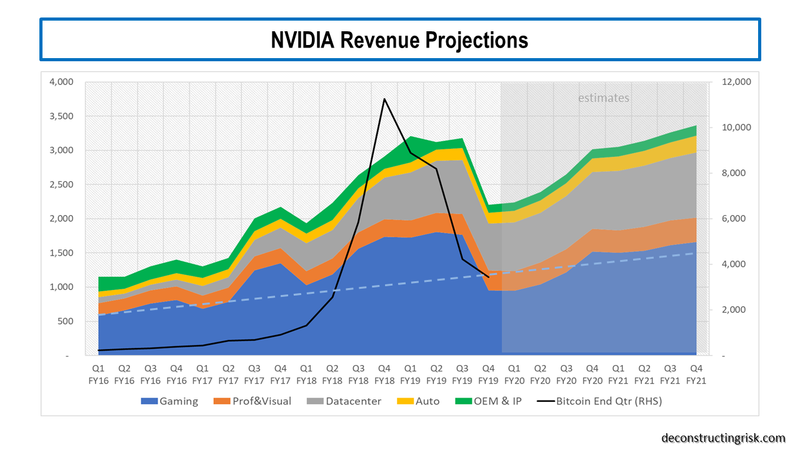 I think the consensus figures for FY2020 on NVDA are too optimistic so I shall watch NVDA’s progress with interest from the sidelines. 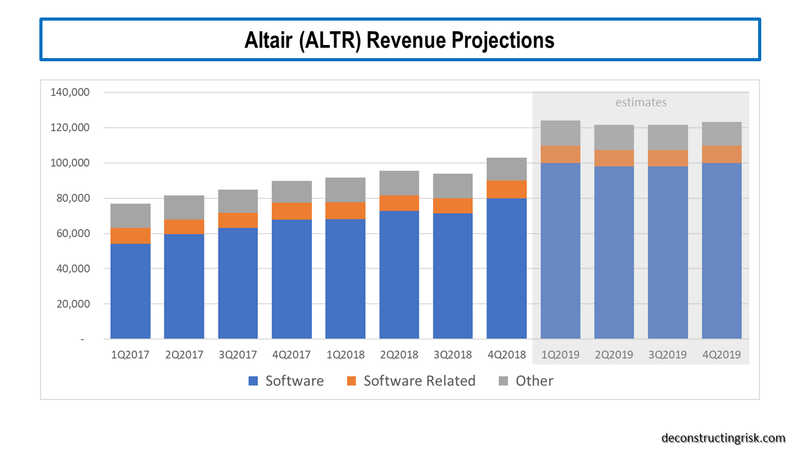 Altair Engineering (ALTR) is not the usual hyped firm. ALTR provide an integrated suite of multi-disciplinary computer aided engineering software that optimizes design performance across various disciplines which recently purchased an AI firm called Datawatch. ALTR is led by the impressive James Scapa and have built a highly specialised platform with significant growth potential. The revenue projections for the firm, including Datawatch and another acquisition SimSolid, with 2018 and prior on an ASC 605 basis and 2019 on an ASC 606 basis are below. The reason for the relatively flat Q/Q is the conversion of the Datawatch business to a SaaS basis and integration into the Altair platforms. For 2019 through 2021, my estimates for EPS are $0.62, $0.81 and $1.17 respectively (2019 and 2020 figures are over 10% higher than consensus). At the current share price of $38.32, that’s PE ratios of 63, 47, and 33. A rich valuation indeed. And therein lies the problem with high growth stocks. ALTR is a fantastic firm but its valuation is not. Another one for the watchlist.